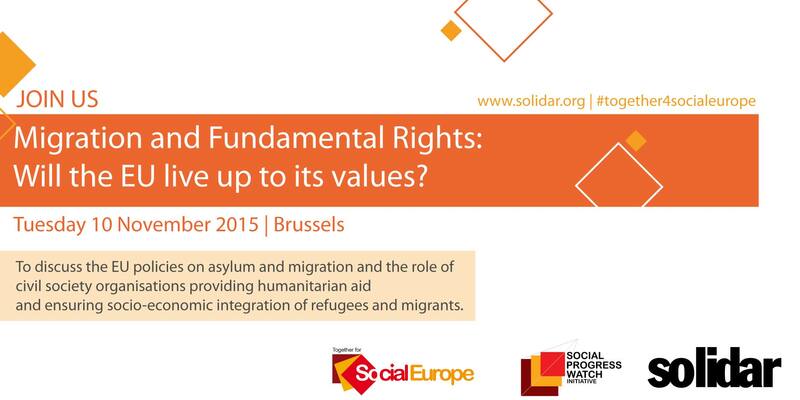 Our next Social Affairs Forum will take place on 30 November 2015 in Brussels. Our Annual Conference will take place on 1 December. Please register here. Migration and fundamental rights: Will the EU live up to its values? 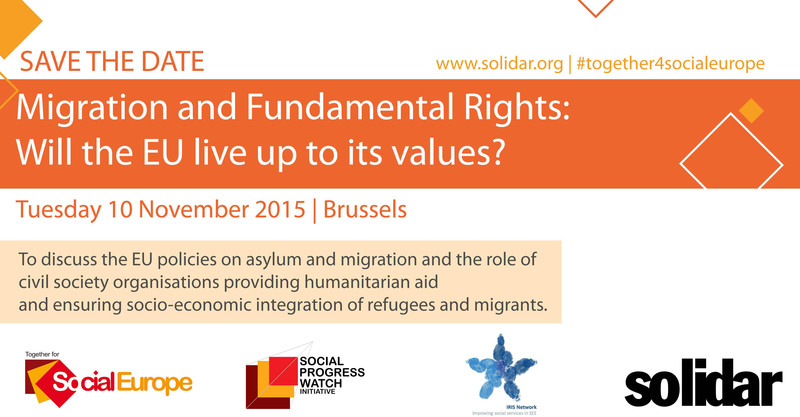 On 10 November 2015, SOLIDAR is organising a round table entitled “Migration and Fundamental rights: will the EU live up to its values?” to be held at the EESC from 12:00 to 16:00. This round table will offer to policy makers and members of the civil society the possibility to discuss about migration, fundamental rights, humanitarian assistance, and integration policies for migrants and refugees in the EU and along the Western Balkan route. The meeting is divided into two sessions in which the following two questions will be discussed; ‘How to put solidarity and respect of human rights at the heart of EU asylum, migration and integration policies?’ and ‘How to support CSOs providing humanitarian assistance and services to refugees and migrants along the Western Balkans route?’. More information and the draft programme can be found here. 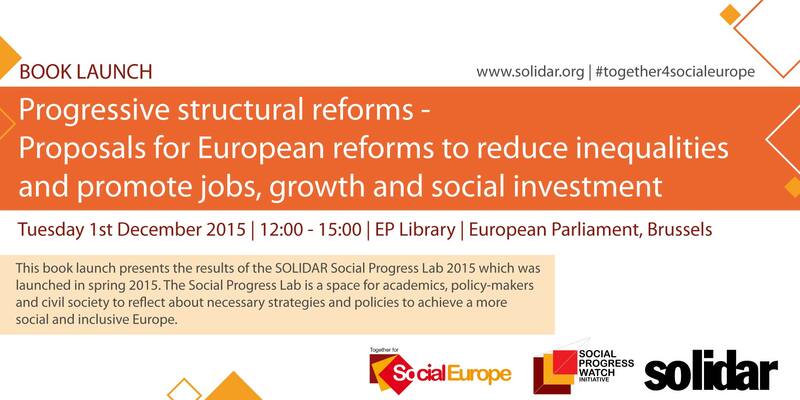 This publication presents the results of the SOLIDAR Social Progress Lab 2015 which was launched in spring 2015. The Social Progress Lab is a space for academics, policy-makers and civil society to reflect about necessary strategies and policies to achieve a more social and inclusive Europe. It collects the analysis by 10 academic scholars from across Europe with a focus on identifying and targeting inequalities, shaping social investment and European policies affecting social safeguards, and thereby seeks to enrich the policy debate at European and national level about alternative structural reforms. 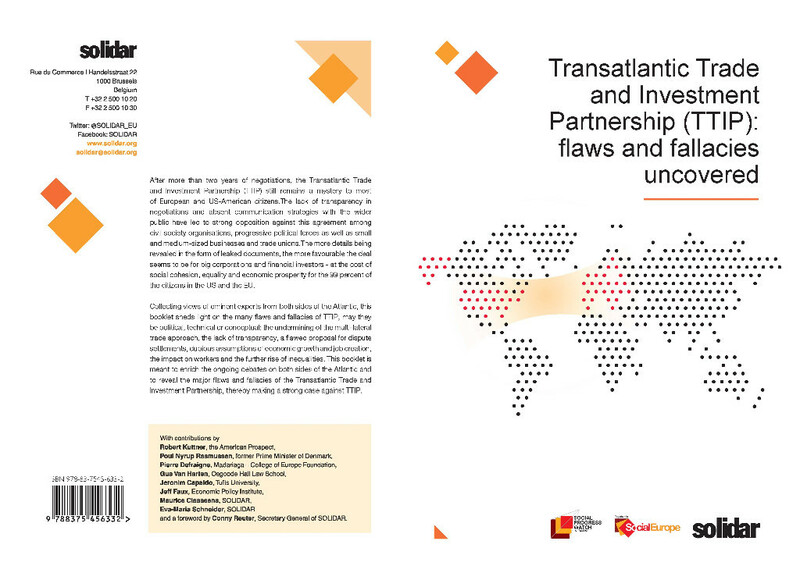 The edited volume was developed under the scientific guidance of Rémi Bazillier, Giovanni Cozzi, Amandine Crespy, Ferdi De Ville and Angela Wigger, as well as Special adviser Lieve Fransen, and in addition comprises contributions by Nicolas Schmit, Luxembourg's Minister for Labour, Employment and the Social and Solidarity Economy as well as Thomas Händel, MEP, Chair of the Committee on Employment and Social Affairs of the European Parliament. In addition, the SOLIDAR Social Progress Watch country reports 2015 will be launched at the event. We would like to inform you that the SOLIDAR secretariat is currently feeding into the following legislative and non-legislative processes in the European Parliament, mainly in cooperation with the Greens and the Social Democrats. Our contributions are based on your inputs to the Social Progress Watch 2014. We will of course keep you informed! The Commission has published a Call for proposals for social policy innovations supporting reforms in social services, deadline 16 November 2015. New EU Trade Strategy - New Approach? Public Procurement - New Guide published! Copyright © 2015 SOLIDAR Foundation, All rights reserved.